I’m new to flashlights so please forgive me if my inquiry seems obvious. I have been researching and lurking around here for the last couple of weeks, but didn’t know a world of flashlights like this existed before then. There are some really wonderful and helpful posters on here so thank you in advance to the forum members. Does it make sense to get a 7135*6 or 7135*8 driver given biscotti can go down to .1% (moonlight) thus allowing me the same benefit as I originally intended, but with more available output if needed? Being new, I’m having a hard time conceptualizing how low these lights can go – or for that matter how bright. Also, I read the thread on a desert tan model coming out. Any new word on that? I would be really, really excited to get that color. Finally, I’m open to any other advice regarding the best performing protected battery (I have 4 young kids who are very curious) or chargers, etc., etc., etc. I’d go with the 7135×8 with the new driver. Moonlight mode is awesome, you’ll love it. Desert Tan color still hasn’t been finalized. Simon is having a new sample made at the moment. Release is probably still a few months out. As for batteries, I’ve heard good things about Panasonic 3400mah cells. But really any name brand (Panasonic, Sanyo, Samsung, etc.) battery will be fine. The Liitokala Lii-100 and Xtar Mc1 Plus chargers have worked well for me. I ended up going with the *8 driver. Some people recommend the *6 as it draws 700mA less which equals about 200lm less on high but generates a bit less heat. The tint you chose is the warmest for the S2+, it will be very yellow/orange. Check the comparisons Maybe that’s what you’re going for, just want to make sure you know. This is probably one of the best & highest capacity protected 18650 out there. Any charger off that same site will work as well. That tint comparison picture is right on the money too. I saved it for future reference, thanks for sharing. I have somehow never seen that one. Good info ‘elwood’. That tint comparison picture is right on the money too. I saved it for future reference, thanks for sharing. I have somehow never seen that one. Thanks. Just for clarification, the image is not mine. But it’s from another forum and i’m not sure if it’s against the rules to post links from other forums on here. Either way it is still a good picture and thanks for posting it. Ok, i read the forum rules and i didn’t see anything about posting links to other forums. Mods, if it’s not allowed, sorry… This guy has some great info on the S2+. It helped me quite a bit when buying my first one. My goodness, that is some good, no great; info on the S2+….. all in one place. Thanks for the link. It is a great reference to the S2+, as well as a few others in the S series. I say go for the 7135×8 version you can set the modes for the brightness you need at the time. And if you need a bright light it will be there. The battery will still last a very long time on lower modes. And a good name brand battery will last you 300-500 charge discharge cycles. I do recommend two batteries. Just in case something happens and you need one while the other one is charging. And if you plan on buying more lights you need more batteries anyway. Its basically the same price for the *4 *6 *8 driver and you will want bright and brighter lights. Even on high it gets warm but it won’t get hot enough to burn or anything at 2.8 amps. I have one running at 5+ amps. Another thing, if you buy directly from Simon’s (The creator of Convoy? )” store”:https://www.aliexpress.com/store/330416, you can request a driver with the newest Biscotti firmware for $1 more. It has a ton more modes than the previous firmware. You have to place your order and when you get to the step to pay, hold off and send him a message through his site requesting the new firmware. He’ll adjust the price automatically then you complete your payment. Also, the blue, red, and green versions come with a, IMHO, really nice metal tail-switch. However, it’s not as waterproof as the plastic switch and rubber boot on the grey & black version. Great info everyone – thank you! Yes – I love the orange/yellow tint and even run my laptop on the 2700k setting using f.lux. So I’m definitely getting the 7A. I want low, but I just can’t conceptualize how low is too low. I’m not looking for major output. I’ve pretty much already decided my next light will be the BLF A6 with the 3D tint. This light is going to be for indoor use only. Its a bit hard to convey, but basically, I have 4 young kids who manage to leave things out, leave attic lights on, leave basement lights, etc., etc. Add to that, I’m often up in the middle of the night or get up really early. elwood – thank you! I’ll be getting the battery you recommended. I have seen the info from those two links. 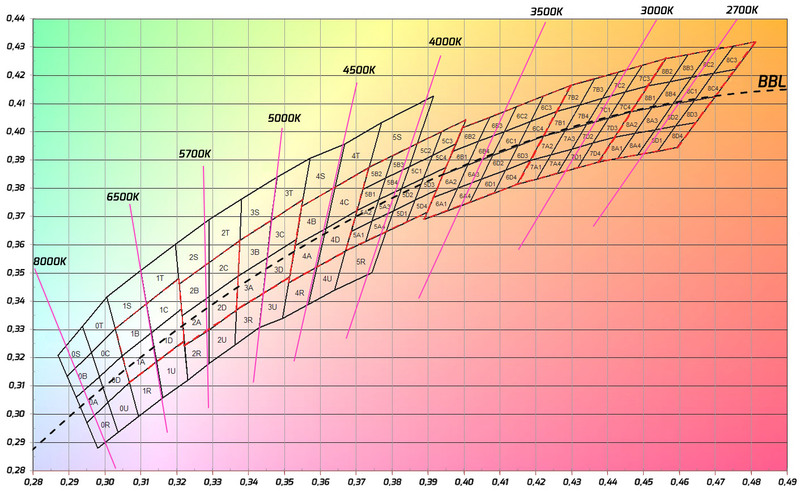 In fact, I was trying to use the chart to calculate the lumen output against the settings on the new Biscotti driver, but am not having any luck – bad at math, too new, who knows?! I wish the comparison table with Bin and Driver were updated with the new driver options. LenZ “…“moonlight” is really, really dim. Virtually useless, IMHO, except for not stumbling over something in the dark.” Not stumbling over something in the dark is exactly my goal! And shutting off lights in basement/attic (big sodium lights with a pull string, which leaves me in the dark on the way back). And I want to do all that without waking anyone up. To me, “moonlight” is around 2-3lm, or low-low. “Firefly” is sub-lumen, and for me (eyes like a cat), is immensely useful for being able to see yet not ruin my night-vision. And as you describe it, maybe derisively, is exactly what it’s best for! ‘Though for real night-vision firefly mode, I’d get one of the warm-warm 219s that Fasttech sells in a 3-pack for a few bux. That’s like 2700K or lower, for a really warm candlelight tint. Put that in something like a Jet I or a WK50, and it’s nighttime heaven! Your welcome ‘elwood’. Either way it is still a good picture and thanks for posting it. Ditto on the thanx, as I never saw it before, and that’s a really nice and descriptive pic. This guy has some great info on the S2+. It helped me quite a bit when buying my first one. My goodness, that is some good, no great; info on the S2+….. all in one place. Thanks for the link. It is a great reference to the S2+, as well as a few others in the S series. The reason I haven’t done an updated version yet is that there’s only one Convoy light available as stock with the new driver. That’s the clear-anodised C8 with XPL HI LED. Everything else is special request or DIY. I’m basically waiting to see what other stock options come out so I don’t waste my time crunching numbers for the wrong stuff. Your Thread has a ton of good info in it…. all compiled in one easy to read & see reference. You must have put a load of time into compiling this, thank you again for sharing it. I hope at some point you’ll post it here on BLF. As far as I am concerned it should deserve “Sticky” status. Phlogiston – brilliant and thank you! Your original comparison thread was extraordinarily helpful, as was this addition. Thank you! I have a T4-7A S2+ myself, so you got me wondering what the Biscotti mode levels would be. The way to get me to answer questions is always to pique my curiosity! While I have you, I have one more question if you don’t mind. If I get the 7135*6 2100mA driver, how long could you run that on high before it becomes uncomfortably hot? Your chart suggests the high lumen output for 2100mA is 550 lm. There are times where I may need to run flashlight at the brightest available for 30 minutes or more. My thinking is, I could rund the 2100mA on high for a longer period of time than the 2800mA and it would be brighter than stepping down the 2800mA to 50%. But I’m not sure if 30 min. on high is too much for the 2100mA. I wonder: given the tint comparison chart, what tint looks most like an incan lamp? I thought it was the T4-7A, but the picture makes it look like it’s an incan on a brownout. The T5-5B seems closer to what I’m looking for. Another thing, if you buy directly from Simon’s (The creator of Convoy?) store, you can request a driver with the newest Biscotti firmware for $1 more. It has a ton more modes than the previous firmware. You have to place your order and when you get to the step to pay, hold off and send him a message through his site requesting the new firmware. He’ll adjust the price automatically then you complete your payment. That is AWESOME information, elwood, thanks a bunch Finally I can get a Convoy with a non-blinky Low mode! I was going through the same dilemma and read the same very useful info. Personally I use moonlight 90% of the time when indoors. I have the 8*7135 version. The next mode 1% is already too bright for me. From my calculations (likely off, as I’ve used a linear proportion between current and lumens, but it serves as a baseline), 0,1% moonlight on 4×7135 should be about 0,5lm. Good enough for me myself. I use an old S2 w/2.1A driver as my EDC and frequently tailstand it on my dresser in the morning while getting dressed so as not to disturb my wife. I had the original “2-group” driver with the annoying low mode blink & memory. I used to have an old XM-L T6 4C in it, but changed it over to an XM-L2 T5 5B1. The 5B1 is without doubt my favorite tint and the one that most realistically represents colors to me. I finally got my self setup and educated to flash my own firmware and flashed STAR (regular on-time memory). I set it up with no memory and modes of: 3.5% – 34%-100%. I found low was still too bright and “on-time memory” (even on a driver with “no memory” since it affects mode changing while the light is on) was really driving me crazy! So I added the off-time capacitor and reflashed STAR Off-time with low adjusted down to 1.4% (I aimed for 1% and actually got 1.4%). The off-time memory work fantastic (exactly as expected) and now I know what all the rave was about! Low could still be adjusted a little lower though. I am one that does not light “moonlight” (i.e. a barely glowing emitter that doesn’t hurt your eyes to stare into) as I see no real purpose for it (not for me anyway). My guess would be that something around 0.5% output in my case would be ideal. It’s really nice being able to tweak firmware and reflash drivers to give you exactly what you want! About your decision on which driver (2.8A vs 2.1A, etc. . . ). I agree with others that you can always choose a lower mode and only use max as needed. With custom firmware you could create a “Turbo” with or without a timer (I’m out of the loop on temperature sensor firmware) and have high up around 75% or so where turbo is barely a step up for “max” while “high” is your normal able to run unlimited time high mode. My S2 at 2.1A will get hot on high after a minute or two, but it’s not scalding. I’ve never tried to keep it on high for long periods of time though. (I have discovered it in my pocked switched on by accident and feeling hot.) I know user Comfychair has posted up that he would let similar lights (like S6, S3) run on high (2.8A? not sure) sit and run for long periods to prove that no damage was done and that the bodies could handle the heat. I feel the 2.1A version is a good level for the S2 and good balance of runtime with output (2.1A draw on a Panasonic NCR18650B 3400mAh cell tested at 3,128mAh @ 2A draw would yield approximately 1.49hr runtime (3128/2100=1.49) and I calculated 470 lumens out-the-front in my D.I.Y. sphere on my previous XM-L T6 4C emitter). I will be retesting my S2 again in the near future. I also need to get back to my sphere work and analyze how my sphere calibration is working out. To complement what garrybunk said: a 2.1A torch would be a 6*7135. I don’t have any 7135*6 driven lights, so I can’t answer that with certainty. The best I can do is point you to my discussion of S2+ thermals on CPF. My estimate was 3 minutes 45 seconds, but you have to understand and agree with my method before you can adopt that figure. Thanks for your information, i will note it just in case i need, it really helps. Neither of your links match with those that elwood posted. Both point to some “Jio TV App” stuff. Go back up and look at post #26… ‘dingdong’ changed the links when he quoted you ‘elwood’. I guess he had nothing better to do on his first (and hopefully last) post here on BLF………..
Ahhh, Good catch! Gotta hand it to em, that’s some pretty slick spamming. I guess he had nothing better to do on his first (and hopefully last) post here on BLF…. Yeah, it was a valiant effort on his part I guess…….